I recently saw a new soda called "Sierra Mist Natural" for sale. Apparently, the only thing that differentiates this beverage from regular Sierra Mist is its use of real sugar instead of high fructose corn syrup. I'm a marketing professional, so I know all about choosing the version of the truth that is most flattering to you, but I fail to see how this makes the drink more "natural." The truth is that most food products we buy are heavily processed in some way or another. Apple juice doesn't just rain down from heaven to be caught in the leaves of plastic bottle bushes. The apples must be picked and pressed and the juice strained and bottled. While I'm all for trying to minimize the amount of unnecessary refining that's done to our food, some processing is necessary. If we all became organic locovores today, most of us would starve to death tomorrow because of lower crop yields and quicker spoilage. 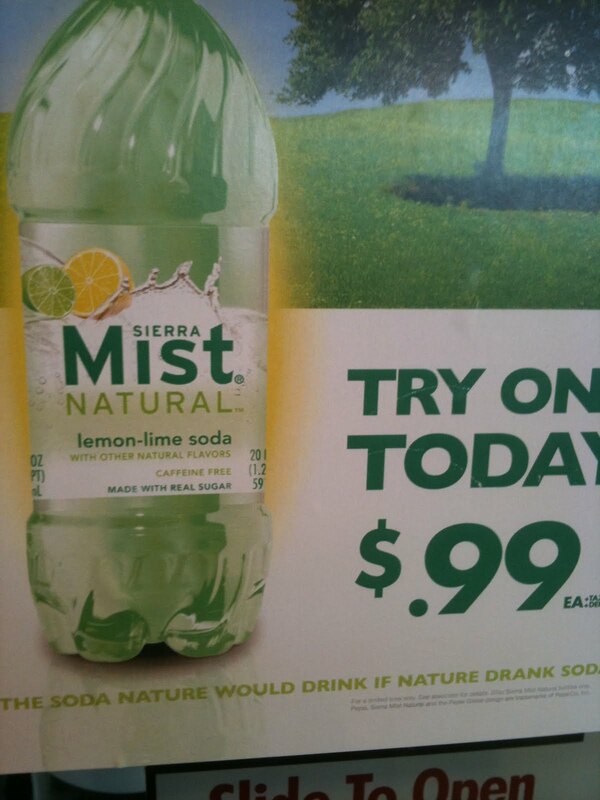 But back to Sierra Mist. Even more unbelievable than the claim that corn is artificial is the claim by Diet Sierra Mist that it contains "100% natural flavors," despite the fact that it contains the artificial sweetener aspartame. Several other aspartame-sweetened diet drinks make this same baffling claim. Is "sweet" not considered a flavor now? Or are they really trying to tell us that aspartame is somehow more natural than corn?